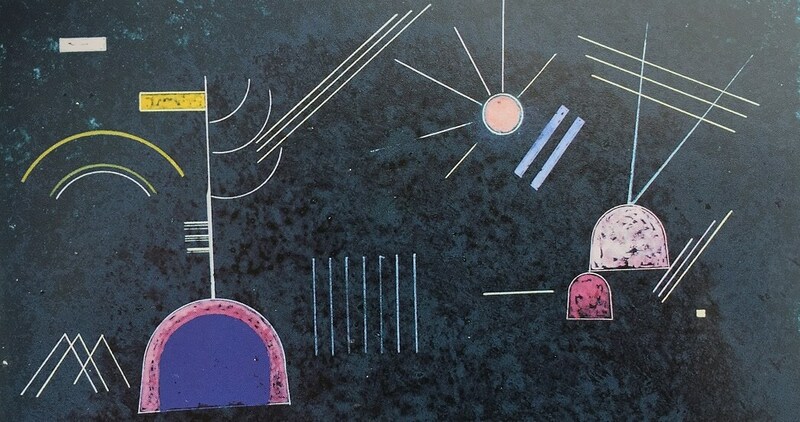 In 1930 Kandinsky travelled to Paris, submitting work for the Circle et Carre ('Circle and Square') exhibition at the Galerie 23. The artist and critic Michel Seuphor (1901-99) and another artist Joaquin Torres-Garcia (1874-1949) founded this short-lived group that had abstract aspirations. Although not well known as artists, they succeeded in bringing together a number of key avant-garde artists for this exhibition such as Hans Arp (1886-1966), Le Corbusier(1887-1965), Fernond Leger (1881-1955), Piet Mondrian (1872-1944), Amedee Ozenfant (1886-1966), and Kandinsky, as well as his fellow Russian, the Constructivist sculptor Antoine Pevsner (1884-1962). Although Kandinsky knew Arp from his Munich days, the renewed contact at this exhibition may have brought him into contact with the Surrealist group also based in Paris. The Circle et Carre group was essentially set up to counter the prevailing dominance of the Surrealist group leading by Salvador Dali, Marcel Duchamp, Max Ernxt, and Joan Miro, by providing the journal and exhibition as a forum for the Abstractionists. Arp had a foot in both camps. The title of this work, 'More or Less', suggests the ambiguity and humour present in much of the Dada and Surrealist work of the late 1920s.